(GATESTONE INSTITUTE)—Everywhere that U.S. leadership helped Islamic jihadis topple secular autocrats in the name of "democracy and freedom," indigenous Christian minorities are forced either to convert to Islam or die. 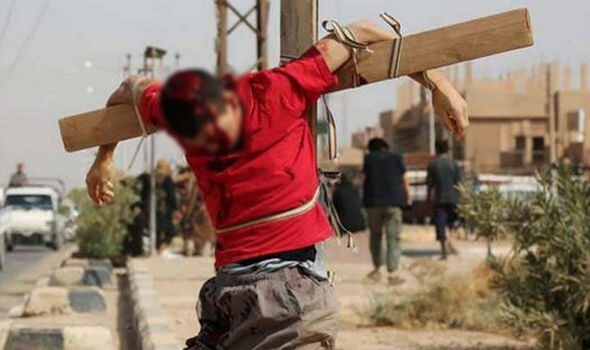 Most recently, on August 28 near Aleppo, the Islamic State (IS or ISIS) tortured, mutilated, publicly raped, beheaded and crucified 12 Christians for saying they "would never renounce Christ" for Muhammad. The jihadis took one group in front of a large crowd. They cut off the fingertips of a 12-year-old boy, who steadfastly refused to submit to Islam. They "severely beat him, telling his father they would stop the torture only if he, the father, returned to Islam." He refused, so they "also tortured and beat him and the two other ministry workers. The three men and the boy then met their deaths in crucifixion." According to a Christian leader associated with the martyrs, "They were left on their crosses for two days. No one was allowed to remove them." A sign saying "INFIDELS" was placed next to their crosses. "The Islamic extremists then publicly raped the women, who continued to pray during the ordeal, leading the ISIS militants to beat them all the more furiously. "As the two women and the six men knelt before they were beheaded, they were all praying. "'Villagers said some were praying in the name of Jesus, others said some were praying the Lord's prayer, and others said some of them lifted their heads to commend their spirits to Jesus,' the ministry director said. "One of the women looked up and seemed to be almost smiling as she said, 'Jesus!'" "After they were beheaded, their bodies were hung on crosses, the ministry director said." The same is happening in the two other Arab nations where the U.S., under the pretext of "freedom and democracy," overthrew the secular dictators who had long kept a lid on the jihadis: Libya and Iraq.